For virtually my entire career to date, I have been a shareholder, director and employee of businesses I have established. So although I am a “technician” first and foremost, I am not “just” a technician, oblivious to the needs of business. Also, most of the following work history details are in the context of working my business with many different client companies at the same time. With some companies (like Holdfast NZ) I was considered to be part of their management team - their IT Manager and at times their acting Chief Technical Officer. For the last three years I was primarily employed by Kiistone Business Infrastructure Limited) as their "IT Manager". In this role I was responsible for maintaining and extending their "Private Cloud" infrastructure located in New Zealand datacentres. We operated more than 50 servers that served all the needs of around 350 users in 21 locations nation-wide. I have always been a visionary and have been quite innovative and creative in all that I have done. I have been told that I have an unusual ability to very quickly comprehend both the overview and the fine detail of a solution, then to systematically carry out whatever needs to be done to see the vision fulfilled. I love a challenge, I love working with technology in general, I love what I do and I know that what I have to offer has been and is quite valuable. I am a very experienced developer. This includes the single-handed creation of three operating systems, a communications protocol and several industrial process monitors and controllers earlier in my career, followed by a comprehensive “Enterprise Resource Planning” and financial management system which was later coupled with automated business process capability. See the list of old products I developed, in the panel to the left. Click on any link to view a brief description of each. The following lists major products developed and some of the clients that used them, in reverse chronological order. It does not include more recent consulting work done since Crusader was declared to be at "end of life". Crusader" is a comprehensive business and financial management ERP (“Enterprise Resource Planning”) system I wrote. All code was written using a strictly structured methodology in a way that made it an interpreter. This approach allowed almost unlimited changes to be made while remaining totally reliable. The level of adaptation this permitted enabled the system to be set up to exactly match each business’ specific needs, greatly reducing the need for operator training. For the last more than 20 years I have taken the role of Acting CTO, systems architect and developer for a wide range of regular clients, who have operated and grown their businesses using Crusader. I am completely “at home” with guiding a business through the changes required to remain effective and competitive, procuring and / or creating solutions, then managing the change process, whether this is a major change or incremental in nature. The following list of clients represent the most notable ones selected from a much larger number of businesses that I regularly serviced over the period from 1990 to the present. I did so from within businesses that I wholly or partly owned, and that I generally managed. Holdfast NZ Limited Holdfast is an importer, manufacturer and distributor of mainly adhesive products. From 1986 until 2008 I acted as their IT Manager, consultant, D3 developer and business process engineer. I was solely responsible for the development and support of IT systems to meet their growing requirements. Working with the client, automation such as automated packing and despatch control using bar-coded methods, automated reporting and “Business Intelligence” / data warehousing capabilities were added. This work was increasingly business process focussed, with emphasis on staff compliance and risk management. I successfully guided their transition to Microsoft Dynamics NAV in 2008. Online Distribution Ltd Online Distribution is an importer and distributor of products required to restock service stations nation-wide. Since 1992 I have acted as their IT Manager, consultant, D3 developer and business process engineer. Working with the client, we have progressively improved their systems, especially by adding a degree of automation to their business processes to improve reliability of service and efficiency gains. This automation includes EDI (“Electronic Document Interchange”) capabilities, automated packing and despatch control using bar-coded methods, an automated rebate claim system and an automated reordering system. Roofing Accessories Limited Roofing Accessories manufactures custom-made flashings and fittings for roofing. The owners originally established Longrun Roofing, and operated their business on Crusader from 1991 until the business was sold to Taylor Roofing Limited. Taylor Roofing elected to install Crusader at their other three branches, where the system continued to be used even after the businesses were sold to Steel and Tube Holdings Limited. Throughout all these changes I provided Crusader customisation and support. Significant changes were made to accommodate the specific business needs of long run roofing manufacture. Metrotile (NZ) Limited Metrotile is a New Zealand-owned developer and manufacturer of metal roof tiles, operating internationally. Ross Roofing Limited Ross Roofing was a major part of the Ross Holdings group of companies, that manufactured and installed metal, concrete and clay roof tiles. It was sold to Monier NZ, a subsidiary of CSR. Thermakraft Industries Limited Thermakraft imports, manufactures and distributes a range of building products, including building papers, damp course and insulation. Premier Insulation Limited Premier Insulation installs insulation in homes and commercial buildings nation-wide. Blue Print Imaging Limited Blue Print Imaging imports, manufactures (mainly mixing inks) and distributes inks and equipment to the printing industry. They are specialists in screen printing products. All the above Ross group of companies operated their businesses on Crusader from 1992. These companies were brought together as a group with a focus on property development. I provided Crusader customisation and support throughout. For much of this period, I also acted as their Acting CTO under direction from their group CFO. On my recommendation Thermakraft, Premier Insulation, Metrotile and Blue Print Imaging transitioned to other ERP products. I wish them all well for their future. Felton Industries Limited Felton Industries designs, develops, manufactures and distributes a wide range of bathroom plumbing products throughout New Zealand. Some product is exported. From 1993 to 2007 I provided Crusader customisation and support. They followed my recommendation and have transitioned to Microsoft Dynamics NAV. Cremer International Limited Cremer International are importers, manufacturers and distributors of Manchester throughout New Zealand. From 1993 to 2005 I provided Crusader customisation and support. For much of this time I acted as their IT Manager. There were many other businesses that operated entirely from Crusader for many years. MAFQual MAFQual was a division of the Ministry of Agriculture and Fisheries. (Currently known as “AsureQuality”.) I was employed from 1991 to 1993 as a contract business process engineer and software developer based at the Lynfield Animal Health Laboratory and Plant Protection Centre. The initial contract was to rectify many serious faults in the ICS laboratory systems hosted on SCO Unix and the UniVerse database. I went on to largely redevelop and then extend these systems. I enjoyed the laboratory environment, the exacting nature of the work with its significant technical and statutory requirements, and the opportunity to work with other IT and laboratory professionals. In designing the energy management system, all aspects of building management - maintenance, security and energy use were considered. But for a lack of time and resource, the energy management system would have been extended to provide all such facilities. Timber Treatment Plant Operator - preservation of timber by impregnating with the salts of copper, chrome and arsenic. To be able to design a controller for the automation of the Hickson's Tanalised Treatment Plants, it was necessary for me to be fully familiar with the theory and operation of the process. I was often left in sole charge of the plant at Tuakau for this purpose. The operation and management of a modern bakery. This was while building an adaptive dough consistency controller. A mathematical approach was taken to analyse the process' parameters in real time, then apply an adaptive correction to the dough's water content - in effect a form of "artificial intelligence". The theoretical and practical requirements of the optimised kiln drying of various species of timber. This involves the real time monitoring of temperature, humidity, air speed, outside environment and timber conductivity to correctly deduce the optimum conditions for drying timbers without causing warping, cracking or other damage. In the process of creating all the above, I single-handedly developed three operating systems and a communications protocol similar to internet protocol - all well before the IBM PC or the internet. 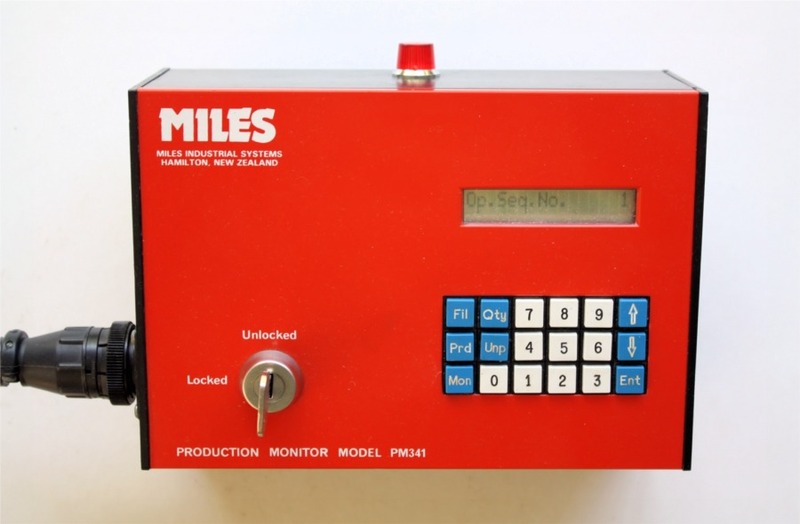 By 1985, when a partnership established by Challenge Corporate Services took exclusive control, Miles Electronic Equipment Limited had produced numerically more microcomputers than all other companies in New Zealand put together by that date. We had built the company to 15 staff, and quite simply outgrown our capital base. Music Carriers Limited Music Carriers was a subsidiary of Philips Electrical Industries that manufactured a large portion of the vinyl records and tapes for music distribution in New Zealand. I was employed to work throughout the factory, learning all the different tasks so that I could take a managerial role. I gained experience as a hydraulic press operator, industrial chemist and sound technician. I was also given the task of developing an automated record master silvering plant. This worked really well and tripled the output of masters which were expensive to cut, thus saving a lot of cost. The combination of all the above experience provides me with a wealth of experience from which I can now draw in discussing requirements of almost any sort, in almost any situation.